Well-meaning advice is abundant when it comes to saving energy. Statements like "switch off the lights when you leave the room" or "don't take the elevator if it's just for one floor" are well-meant. Changing one's behavior, on the other hand, is very hard as we all know. Wouldn't it be nice then to know, which changes in habit actually make a real difference? That is where What is Watt comes in, one step before the well-meaning advice. The project lets people see for themselves, which change in habit truly makes a difference. It, therefore, doesn't just save power but also willpower. The goal of What is Watt is to compare everything with everything. How much energy does my daily train-commute take? (12.8 kWh) How many times can I take one of my famously long hot showers for the same amount of energy? (9 times) Or how many times could I take the elevator for just one floor? (1200 times) In the end, the decision is with each person, if she wants to move closer to her place of work or if she takes a hot shower less often to save energy. New scenarios can be added by interested readers. The calculations are transparent and based on open data. So they are contestable. Being thus open, a range of people may make use of or contribute to What is watt. For example by adding a new scenario of personal interest. How much energy would, for example, be used by a Bitcoin transaction. Or my model railway. Or e-guitar? 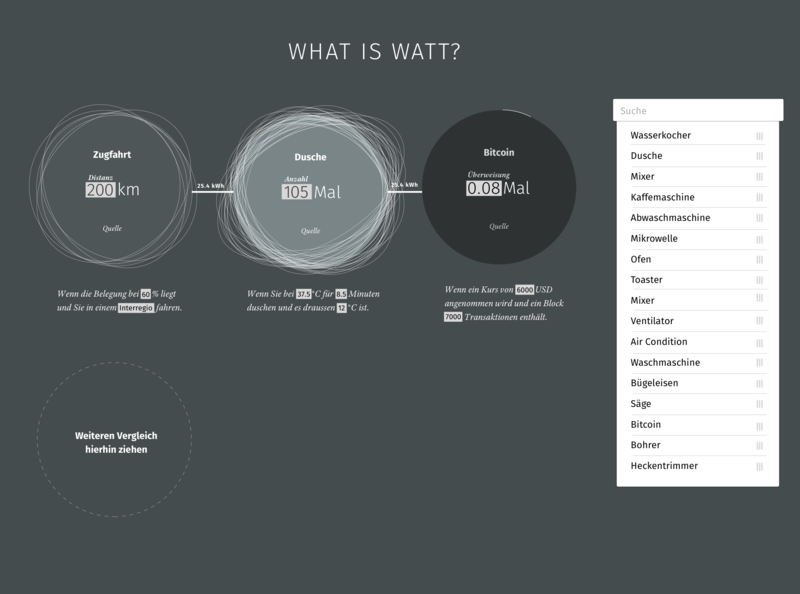 The difficulty in designing What is Watt is, that it needs to be able to accommodate user-added data and stay visually appealing. The design is still work in progress and I will explain some of the reasoning behind the first few iterations. The first design iteration was strongly inspired by designs of currency converter apps. A genre which is a stomping ground for creative designs. This design uses circles to hint at the weight each scenario has in terms of energy usage. The circles also remind of electrons orbits around an atom's nucleus. They this subtly reinforce the topic of electricity. Also, the lines represent an abstracted scale which is held in balance. A visual cue that the values on both sides are equal in terms of energy consumption. 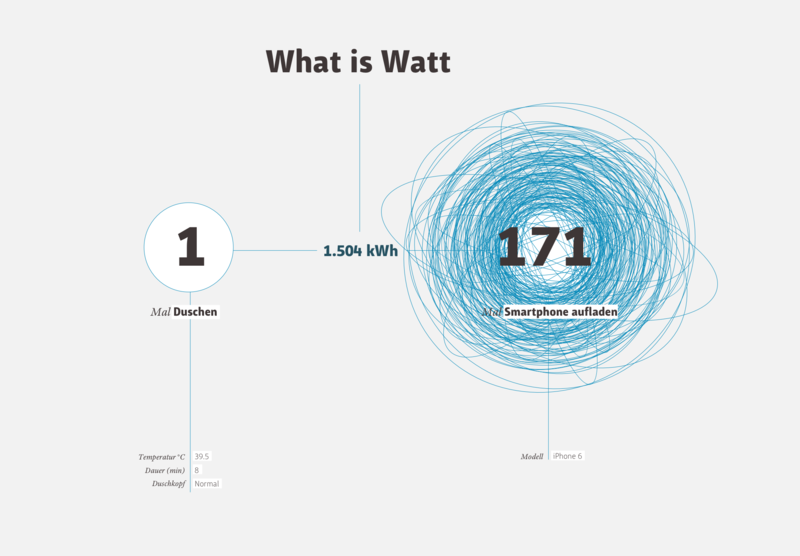 During the 2019 Energy Data Hackdays a team of seven continued to evolve What is Watt conceptually. This also led to one important new design constraint. The design should be able to accommodate more than two scenarios that can be compared. This led to some interesting new design ideas based on having some sort of a map of scenarios. Although these experiments showed new interesting directions, the team concluded that the focus should stay on comparing a few scenarios and the design should not get too abstract or it would lose the appeal it has by being quite specific with the scenarios. The result of this thinking and experimentation process stays close to the first iteration but expands on it. The second iteration evolves the first one most notably by allowing to compare more than two scenarios. It also highlights the list of possible comparisons by making it visible by default. The second iteration retains the circular orbit design but gets rid of the balance-analogy in order to present more than two scenarios. It also clarifies the meaning of the parameters by embedding them in a descriptive text. A searchable list of scenarios is always visible to invite readers to try out different scenarios. The design process is still ongoing and the team is looking forward to making What is watt a reality.